You may have noticed that Greek yogurt is everywhere these days. I even wrote a book about it! (CLICK HERE to buy a copy) Although it’s long been a favorite ingredient for chefs and foodies, it’s only recently become mainstream. Greek yogurt, which is a staple in other parts of the world such as Europe and the Middle East, is richer and creamier than traditional yogurt. Now it’s popularity has spread to the US and sales of Greek yogurt have skyrocketed in this country. Multiple brands of Greek yogurt are popping up in grocery stores and many major yogurt manufacturers are introducing lines of Greek yogurt to get in on the competition. You may have even seen other new products using Greek yogurt, including frozen yogurt and granola bars. So why is Greek yogurt so popular? Is it really healthier than its traditional counterpart? Both types of yogurt are made with milk that has had live bacterial cultures added to it, causing it to ferment. The fermentation process thickens the yogurt and gives it a tangy flavor. The yogurt is then strained to remove the liquid whey. The difference between the two types of yogurt is that Greek yogurt is strained much more extensively to remove most of its whey. Because it is strained so much, it takes a lot more milk (up to 4 times as much) to make the same amount of Greek yogurt than regular yogurt. The result is a thicker, creamier texture similar to sour cream. Protein– Greek yogurt has more protein than regular yogurt- almost double the amount. The high protein content helps keep you feeling full longer. It’s a great option for breakfast to give you long-lasting energy throughout the morning. It can also be a good source of protein for vegetarians. Carbohydrates– Greek yogurt has less (roughly half) carbohydrates than regular yogurt because a lot of it is lost during the extensive straining process. This makes it a great option for anyone watching their carbs, including diabetics. But be careful because the carbs can add up if you add a lot of sweeteners to your yogurt. 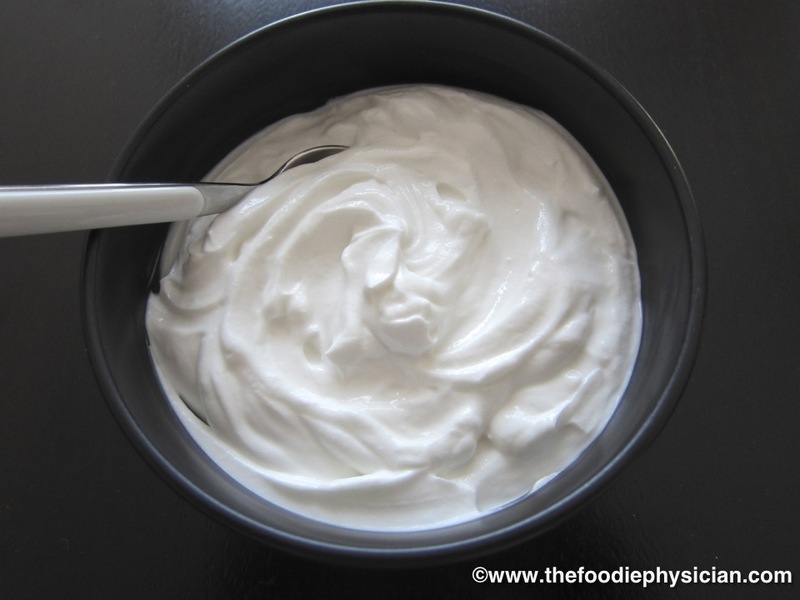 Fat– Greek yogurt actually has more saturated fat than traditional yogurt. Saturated fats in your diet should be limited because they raise cholesterol levels and increase your risk of heart disease. So, if you’re going Greek, choose the fat-free or low-fat varieties instead of full-fat. The good news is that the lower fat versions are so creamy and thick, you won’t miss it. Sodium– Greek yogurt has less sodium than traditional yogurt because a lot of it is lost in the straining process. This makes it a great option for anyone watching their sodium intake. Calcium– Greek yogurt has less calcium than regular yogurt because once again, some of it is lost through the straining process. Although Greek yogurt still contains a good amount of calcium, if you are worried about your calcium intake, make sure you get adequate amounts from other sources. So what’s the final verdict? With more protein combined with less sugar and sodium, Greek yogurt does have a nutritional edge over regular yogurt- just be sure to choose fat-free or low-fat varieties. But with this said, keep in mind that both types of yogurt are good for you and provide probiotics that are beneficial for digestive health- just make sure the label states that it contains live, active bacterial cultures. Now that we know Greek yogurt is good for you, how can you incorporate it into your diet? If you like the natural tangy flavor, you can eat it plain or if you prefer a little sweetness, try adding a bit of fresh fruit or honey. It makes a great breakfast layered simply with fresh berries and granola. Although some people might find Greek yogurt a little too tangy, keep in mind that every brand is different in taste and texture. The specific types of bacterial cultures that are used are what determine the flavor and texture of the yogurt. 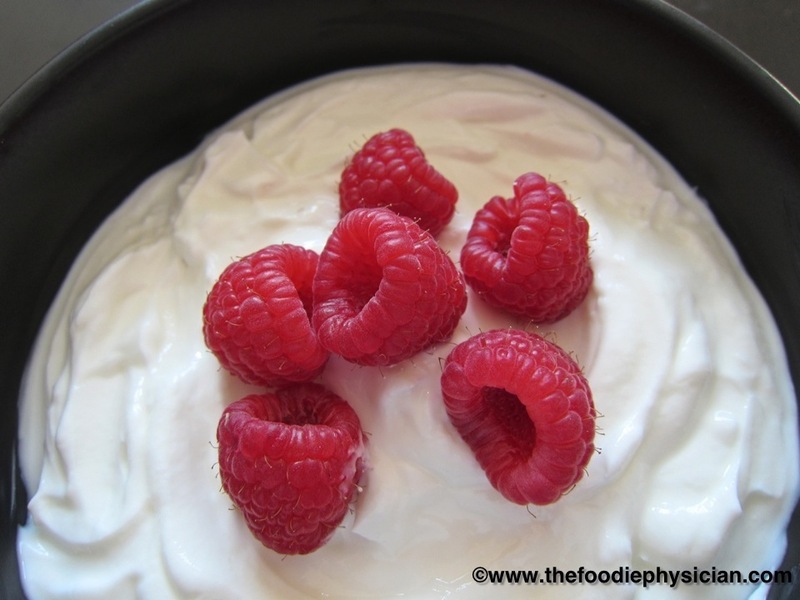 Greek yogurt is very versatile and can be used in so many different applications, both savory and sweet. It makes a great, healthy substitute for calorie- and fat-laden condiments like mayonnaise and sour cream. Try using it as a topping on tacos or nachos instead of sour cream. Or stir in some fresh herbs and use it as a dip for vegetables. Try substituting half of the mayonnaise with Greek yogurt in dishes like chicken salad, potato salad or Ranch dressing. It also makes a great base for marinades because it adds flavor and it tenderizes the meat. Blend it together with fresh fruit and some flaxseed to make an energizing smoothie. It can even be used to add moisture to baked goods such as muffins or cookies. You can also try these easy, summer desserts that use lovely, fresh peaches that I found at my local farmers’ market. Both recipes use Greek yogurt along with grilled peaches but you can use other fruit like nectarines, plums or pineapple. I love grilling fruit in the summer- it’s a great way to heighten their natural sweetness. When you grill the fruit, the sugars caramelize and it deepens the flavor. In the first recipe, I top grilled peaches with a dollop of tangy Greek yogurt, a drizzle of honey for sweetness and a pinch of cinnamon. For some texture, I sprinkle on some heart healthy almonds. This dish makes a great, light dessert or can even be served for breakfast. The second dish was inspired by the classic dessert, Peach Melba. In my version, I top grilled peaches with Greek yogurt mixed with a little vanilla extract for a slightly different flavor. I top it off with a fresh raspberry sauce and sliced almonds for a nice crunch. Brush the peaches with oil. Place them on the grill, cut side down, and cook until grill marks develop, 5-6 minutes. Flip the peaches over and cook another 3-4 minutes on the second side. To serve, place a tablespoon of yogurt on each peach and drizzle with 2 teaspoons honey. Sprinkle almonds and a pinch of cinnamon on top. While the peaches are grilling, place the raspberries and honey in a blender and puree until smooth. Strain the sauce to remove the seeds. Mix the yogurt and vanilla together in a bowl. 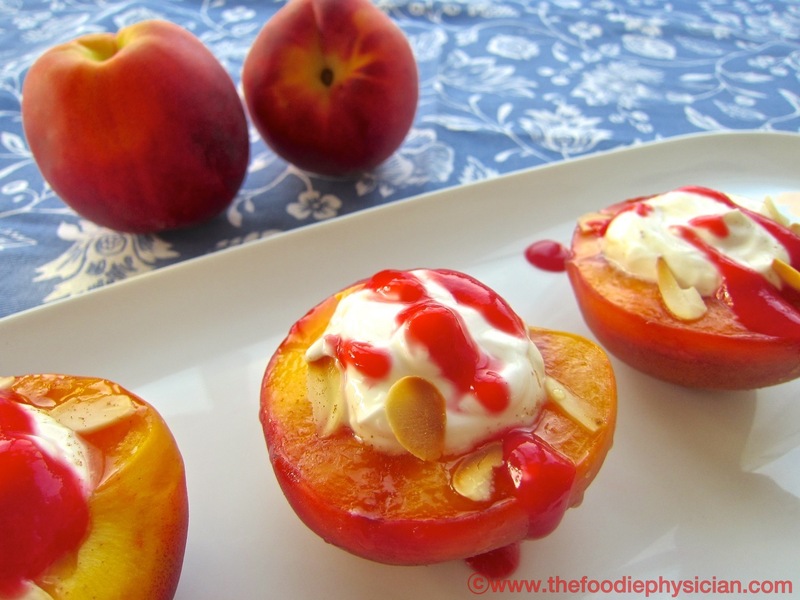 To serve, place a tablespoon of vanilla yogurt on each peach and drizzle with raspberry sauce. Sprinkle almonds on top. What’s your favorite way to eat Greek yogurt? Leave a comment and let me know! How much sugar does it have? I didnt see where you list the sugar grams……………thats what concerns me……………. Don't be concerned! I always list the nutritional information in standard format at the bottom of each recipe. You can calculate the net carbs (sugar plus starch) by subtracting the grams of fiber from the total carbohydrates. To give you a concrete example, a serving of Danon nonfat Greek yogurt (5.3 oz) has 6 grams of carbohydrates compared to a serving of Danon nonfat plain yogurt (6 oz), which has 12 grams of carbohydrates. Because the yogurt has no fiber, the sugar grams are roughly equal to the net carbs. Remember that each brand of yogurt differs in terms of nutritional content, so always read the labels. Thanks for your question! Thanks, Abby! I love it too and often take it to work for a quick and nutritious breakfast. So far one of my FAMILY'S favorite uses is your Tandoori Chicken Kabobs! What is YOUR favorite brand of Greek yogurt? Glad to hear it, Rebecca! I can't say that I've tried all the brands out there but I like to use Fage 0% or 2%. Interestingly, Cooks Illustrated ran a story last year where they taste tested several different brands of Greek yogurt. Their winner in the nonfat and full fat categories was Olympus and in the 2% category, Fage was the winner. 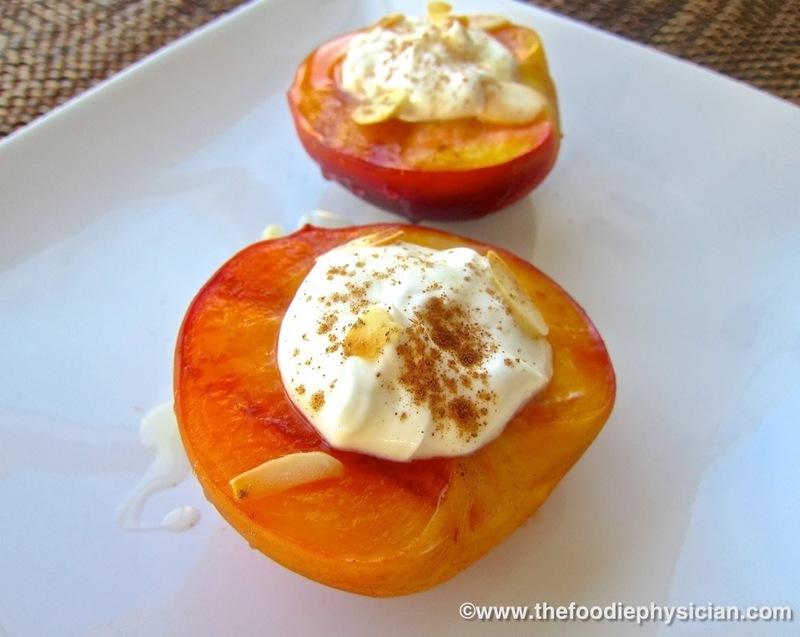 I tried grilled peaches with greek yogurt…delicious !!! My family enjoyed it very much…great recipe! Thanks Fooibi, so glad you liked it! My favorite brand is Greek Gods. Others don't come close to a fine, almost sweet taste. Let's say it is more palatable. It is used as a replacement for sour cream in some of the dishes I might make. I often have made a cucumbers with sour cream but switched to using the yogurt and coarse chopped cucumbers to make a side dish or a main dish for a cool lunch. Add garlic, a bit of salt, vinegar, dill and eat it up! Almost like an Indian condiment served with other spicy dishes. Greek Gods Yogurt might use different bacteria at the start that can make it taste differently and I just can't say I like any other brand I have tried. I can eat the plain right out of the container with nothing added. My dessert is the Greek Gods honey variety and I will just put that in my ice cream machine and eat my treat frozen. I've actually never tried Greek Gods. Great idea to make it into frozen yogurt! I make a cucumber raita with Greek yogurt- sounds very similar to the dish you make. How did you know I wanted to grill peaches tonight? These look mouth-watering and the photos are beautiful! You know I am a fan of Greek yogurt! Thanks for the informative post. Thanks for sharing this with Foodie Friends Friday. Remember to come back on Sunday to vote. I love substituting greek yogurt in lots of different recipes; it tastes great and it's much healthier. Thanks for all the great facts on greek yogurt, and thanks for sharing them on Foodie Friends Friday! This is very helpful information. I make my own Greek yogurt, but I'm not sure if it is truly Greek yogurt. I was taught to strain low fat yogurt in cheese cloth until it's a thickened consistency. Do you think it's the same thing, or should I be buying it instead? Thanks for stopping by! I think that your homemade yogurt sounds great and it's probably more economical than buying it in the store! No need to buy it if you're doing the same thing at home. I could make a meal out of these gorgeous peaches!! Thank you for sharing them,Sonali! My mouth is watering! The grilled peaches are a favorite as is greek yogurt. I made regular yogurt a couple of weeks ago and loved it. I plan on straining the next batch I make. Thank you for sharing on Thursday's Treasures Week 46. <3 and hugs, dear one! 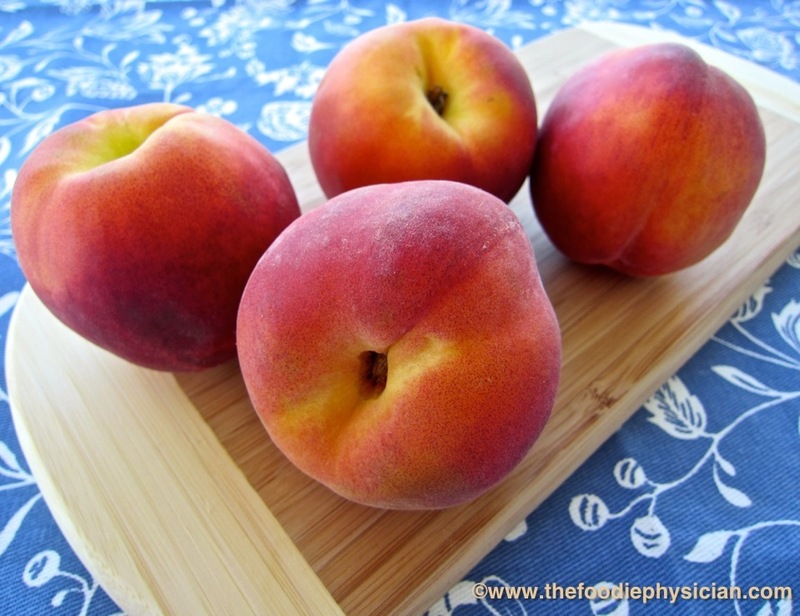 How ripe should the peaches be for the grilled recipes? I would use firm peaches that are ripe or slightly underripe. The grilling process will soften them slightly and bring out their sweetness. Good luck! You know that we LOVE Greek yogurt. 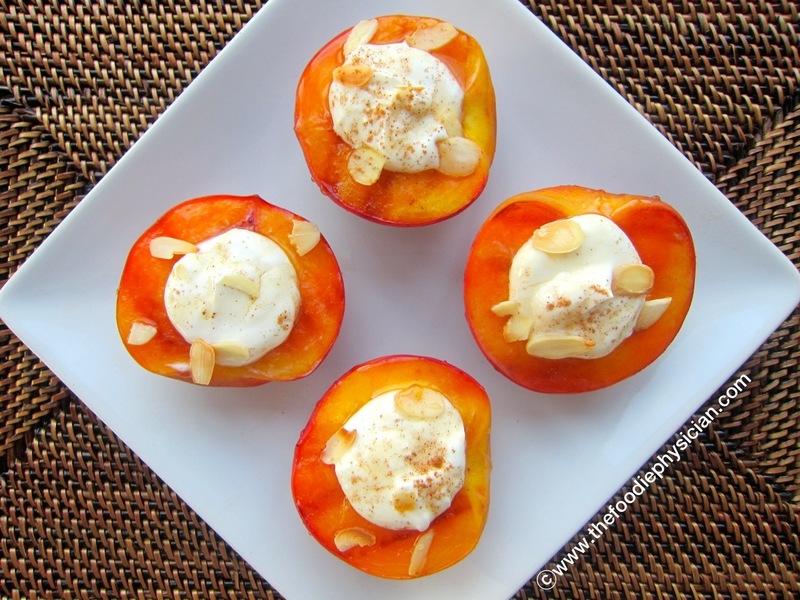 I never thought that grilled peach with Greek yogurt will make such a delghtful dessert. I am trying it before the season is out. Great! Let me know how it goes if you try it! I love making tzatziki- it's one of my favorite dishes and its a great, healthy snack. So glad you found my blog. I hope you'll try out some of my recipes. Good luck with the boards! Good to know it has so much more protein.